Join us in celebrating the past and preparing for the future. 2019 marks the centennial of the dedication of the Chapel of St. Thomas Aquinas. As it prepares to serve a second century of Tommies and other friends, this architectural gem is in need of renewal: a significant gathering space is first on the list, with other rooms for wedding and Campus Ministry offices also needed. 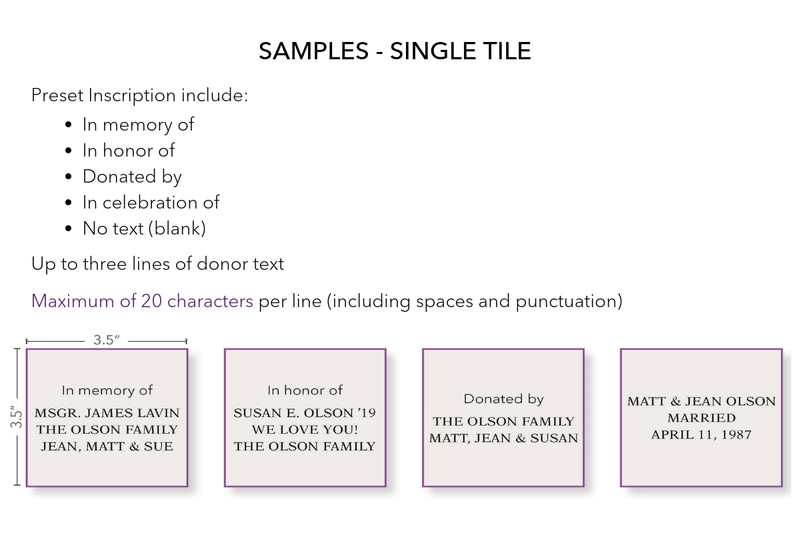 Generous donors who give $1000 or more can be recognized with permanent tiles located in the new center. 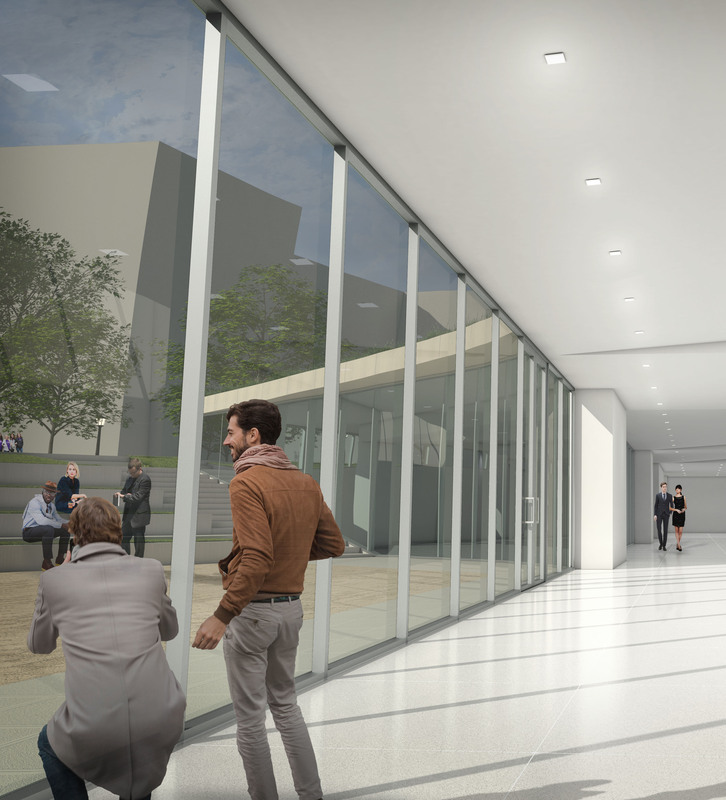 Donors giving $1,000 or more will receive permanent recognition in the new space. Two options currently are available to all who are interested in giving a gift at this level and above. Click through the tabs in this section for more information. 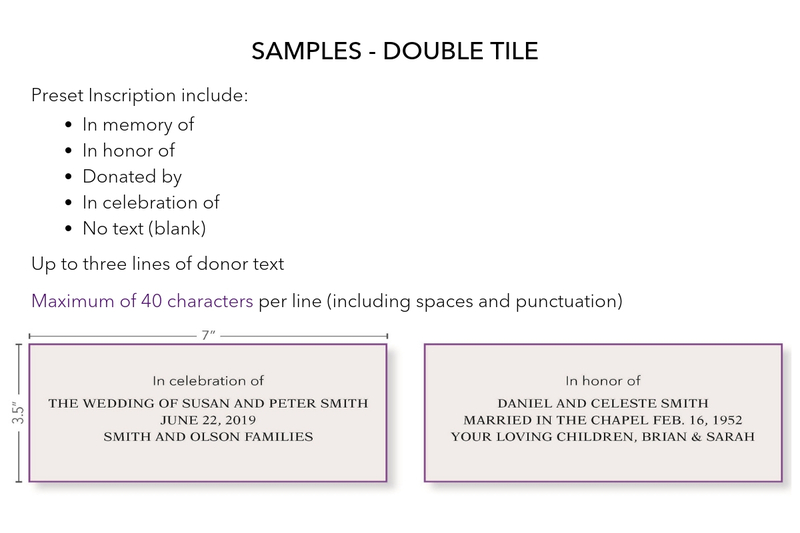 If you are not interested in permanent recognition, we are grateful for gifts of any size in support of this exciting project. Will I see a proof of my tile before production? When will that happen? Yes! The Donor Relations team will email you a proof for review before production. Donors can expect to see proofs beginning in the winter of 2020. Where will the donor recognition wall be installed? 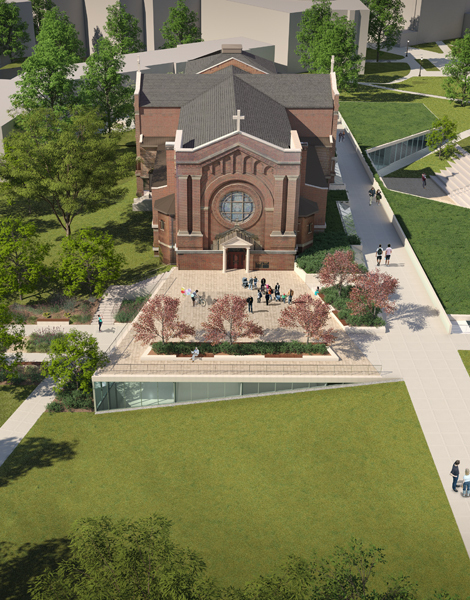 The expansion found at the north end of the chapel will be home to the permanent recognition wall. When will the donor recognition wall be installed? At this time, we anticipate installation during the summer of 2020. Please contact Jennifer O'Brien at jlobrien@stthomas.edu. 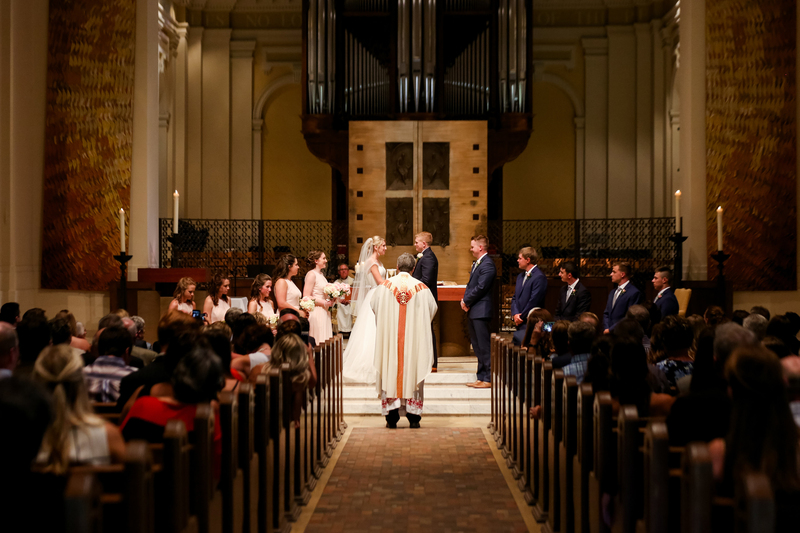 Built by the famous architect Emmanuel Masqueray, who also designed the Cathedral of Saint Paul and Basilica of Saint Mary in Minneapolis, the Chapel of St. Thomas Aquinas was founder Archbishop Ireland’s last and best gift to the university. It speaks to who we are. 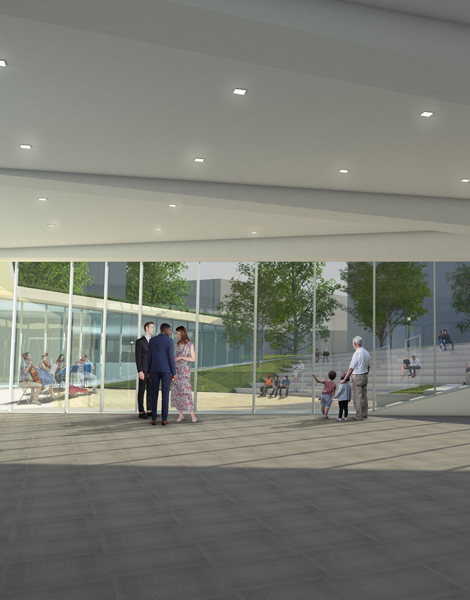 The architecture will be preserved, and the space will be refreshed with updates including new air conditioning, lighting and accessibility features. Meet Al and Brenda Iversen, who have made the lead gift for the transformative Chapel of St. Thomas Aquinas initiative. Their generosity in establishing the Iversen Center for Faith will provide a foundation, and we hope an inspiration, to other benefactors who share their passion for St. Thomas. The Iversens have supported other notable projects at the university, funding the festive Christmas decorations in ASC enjoyed during the Advent and Christmas seasons, and the beautiful House of Fontanini large Nativity figures on display in the Chapel of St. Thomas Aquinas each holiday season. The central role that faith plays in the Iversens’ lives has been a key motivator for their gifts. More than 1,500 couples have tied the knot here since 1990. 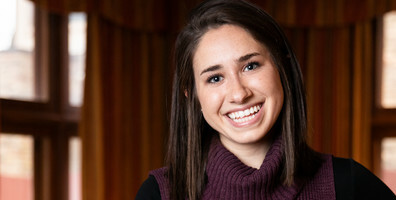 Read the Newsroom article, "Chapel of Love." 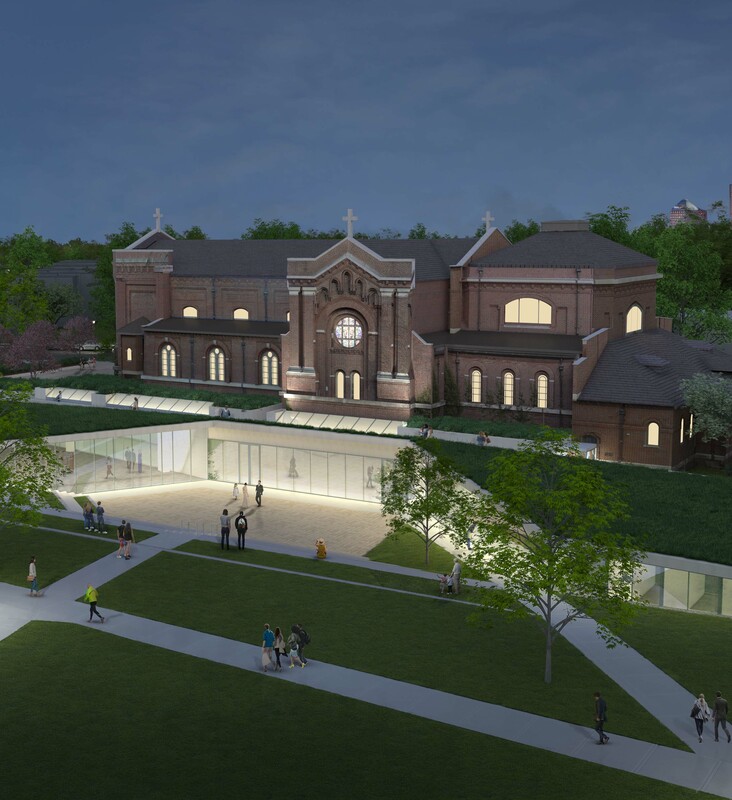 A look at what the chapel will look like at night after the renovation. The main doors of the chapel open up onto a large patio. The view from Cleveland Avenue as you approach the chapel. A birds-eye view from the center of north campus, looking east. The hallway looking out to the upper quad lets in natural light. A view of the sunken patio and seating area, which doubles as a staircase leading to the upper quad. The following features are examples of opportunities to contribute to this effort. Lush gardens and shade trees will surround this warm, dramatic space. 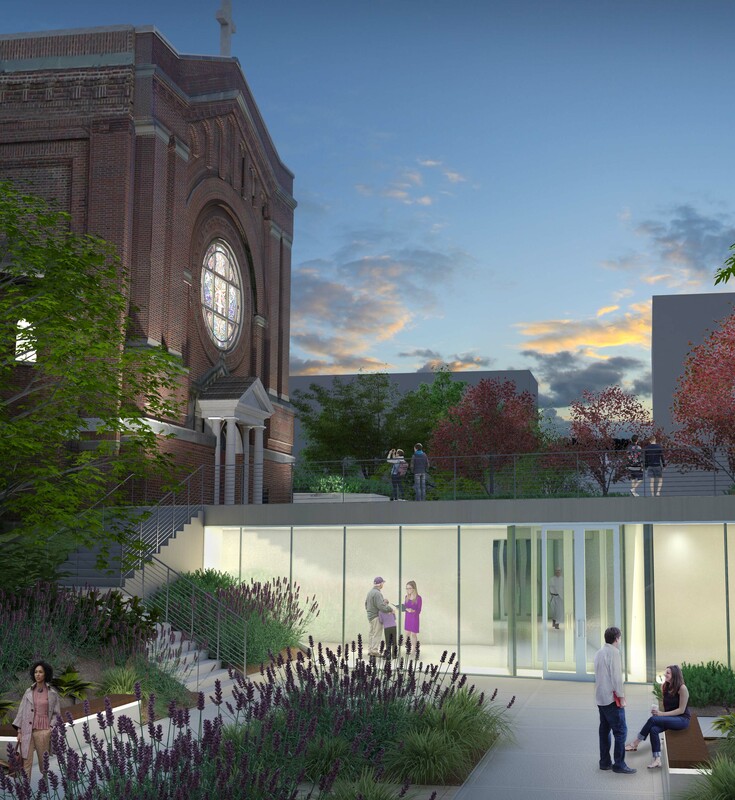 A central feature of the expansion, this inviting outdoor space is suitable for receptions, small concerts, classroom gatherings and retreat presentations, all beneath the dramatic façade of the west transept. Terraced seating nestled into a gradual grass incline will blend the modern with the traditional. 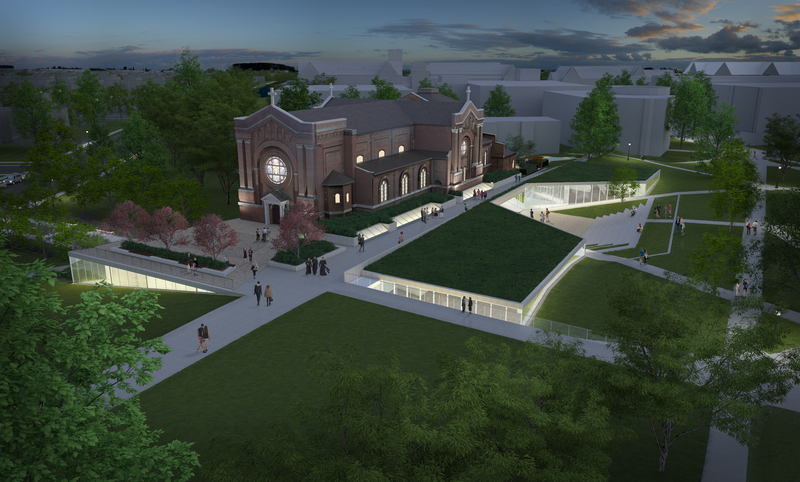 This entirely new access to the chapel will overflow with gardens. It will be a striking visual presence from Cleveland Avenue, and will include a safe, cut-in drop-off area. 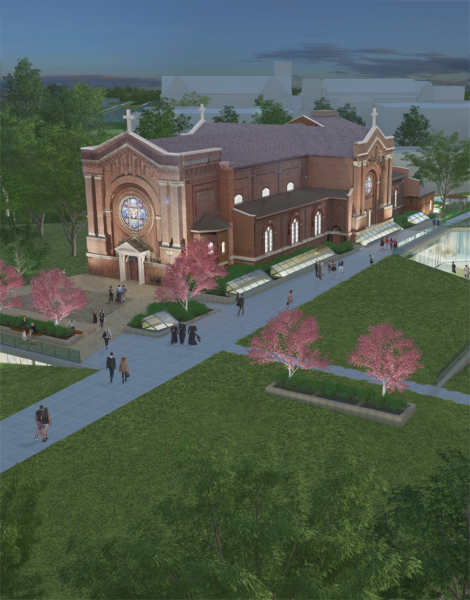 The lobby will be able to serve as a gathering place prior to a procession into the chapel. This office space will bring together Campus Ministry staff members and students in a centralized, welcoming environment, in close proximity to the chapel, sacristy and related spaces.